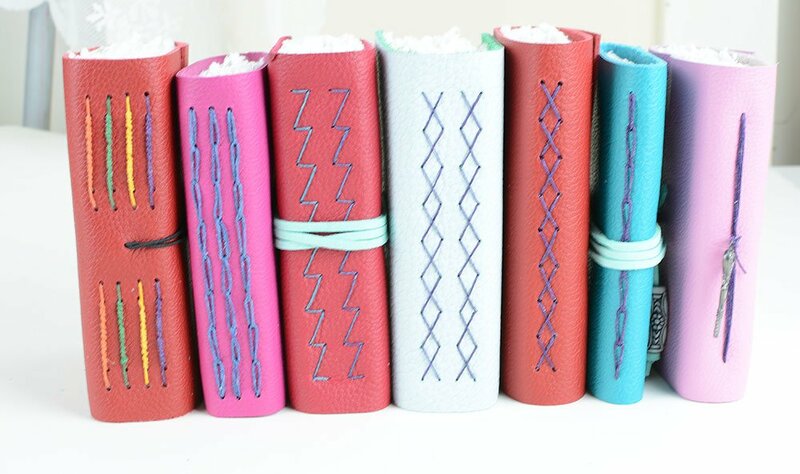 I love to make leather journals, especially those with decorative stitches on the spine. I’ve taught several leather classes in the studio over the past few months, so I thought I’d share some tips that I’ve picked up along the way. For the covers I like to use a soft, flexible calf leather that’s about 1.5-2mm (3.5-4oz) thick but I know some prefer to use a thicker material. If you can, go to a store to buy the leather so that you can handle the piece before buying it. In the US, Tandy Leather is a good resource and they have many locations. If you’re buying online, Pergamena is a good choice and they even have an Etsy store, which sells scrap packs and sale items. Other bookbinding suppliers, such Talas and Hollanders, also have a good selection of leather. Feel free to share more resources in the comments section, especially if you live overseas. Many people use recycled leather in their books, so keep an eye out for leather clothing in thrift stores and for old leather furniture at yard sales. My friend found a gorgeous burgundy leather couch at her local dump! 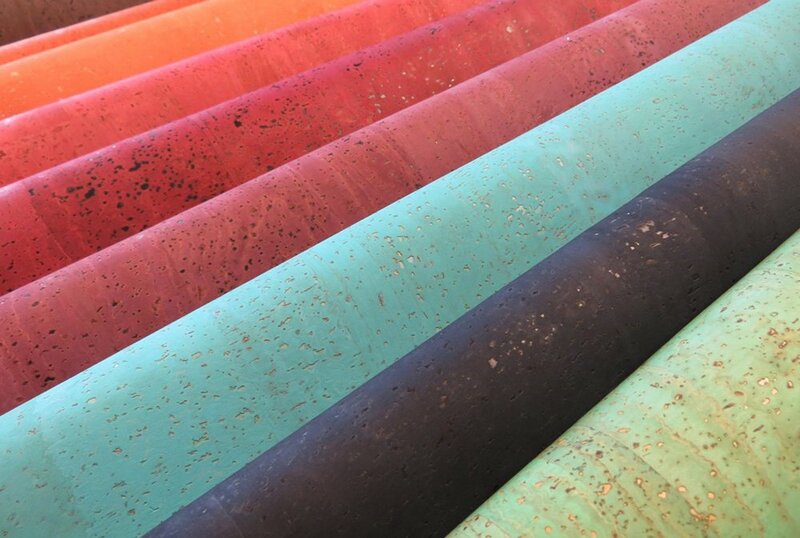 If you don’t want to use leather, there are several sellers on Etsy who offer a good selection of cork fabric in a myriad of colors and patterns. Alternatively you can use a stiff fabric, such as felted wool or canvas – the options are endless. The paper you use for the pages of your book will depend on what you plan to do with it. 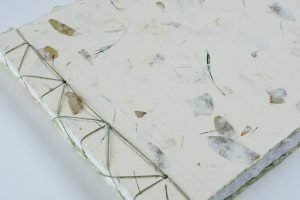 You might find these two blog posts helpful: How to Choose Paper for Your Handmade Book and 9 Tips for Making Awesome Book Pages. For stitching the books, I use a 3ply or 4ply pre-waxed linen thread in a coordinating color and #18 blunt needle. To cut my covers I reach for tools you would normally use for quilting: a rotary cutter, quilting ruler and self healing cutting mat. 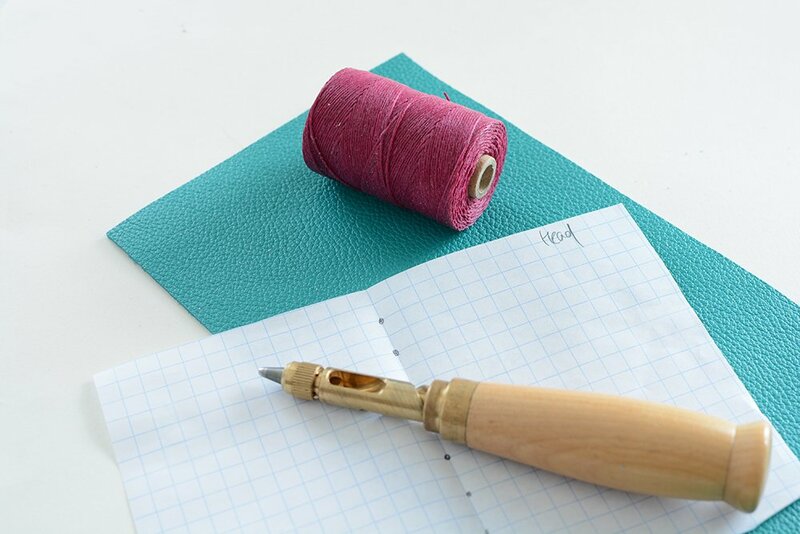 The rotary cutter slices through the leather more smoothly than a utility knife and the guidelines on the quilting ruler ensure that the cover is square. The height of my covers are 1/4″ taller than my signatures, so there’s 1/8″ at the top and bottom. I determine the length of the leather by wrapping it around the stacked signatures, leaving extra for a flap if I want to include one. To create the sewing holes, I use a Japanese screw punch with a 1mm or 2mm sized drill bit. My secret weapon for creating these books is grid paper that I purchase from the a local office supply store. I use ones that have either 4 or 5 squares per inch. I use it to lay out the stitch pattern and then as a guide for punching the holes in the cover and pages. Keith Smith’s Non-Adhesive Binding, Vol. 2: 1- 2- & 3-Section Sewings is the definitive guide to stitch patterns. Remember, you can repeat a pattern several times in one binding. 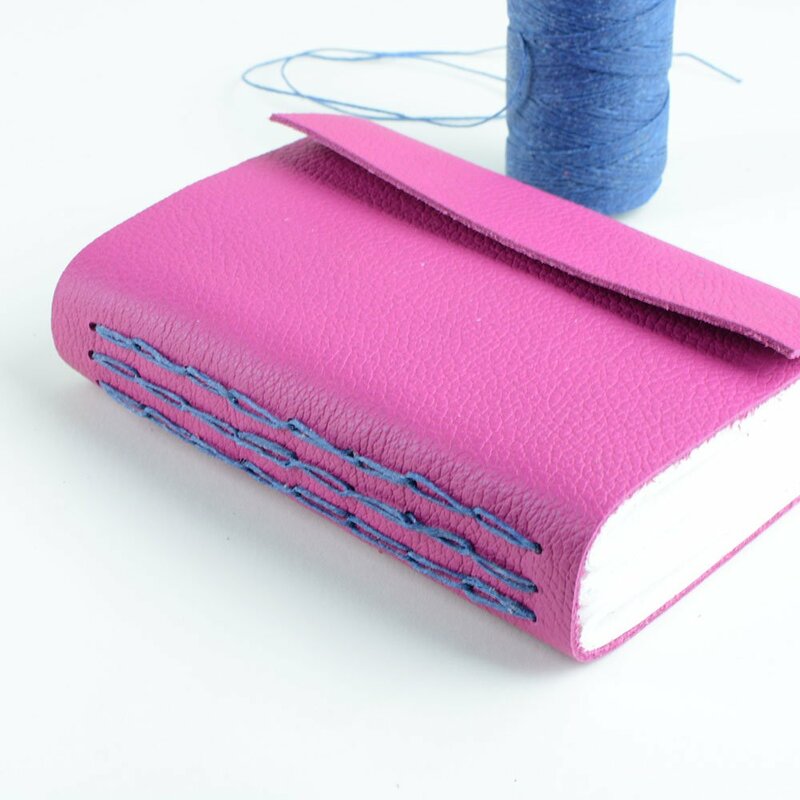 For example the pink journal below repeats the 1-signature chain stitch pattern three times to create a 3-signature book. 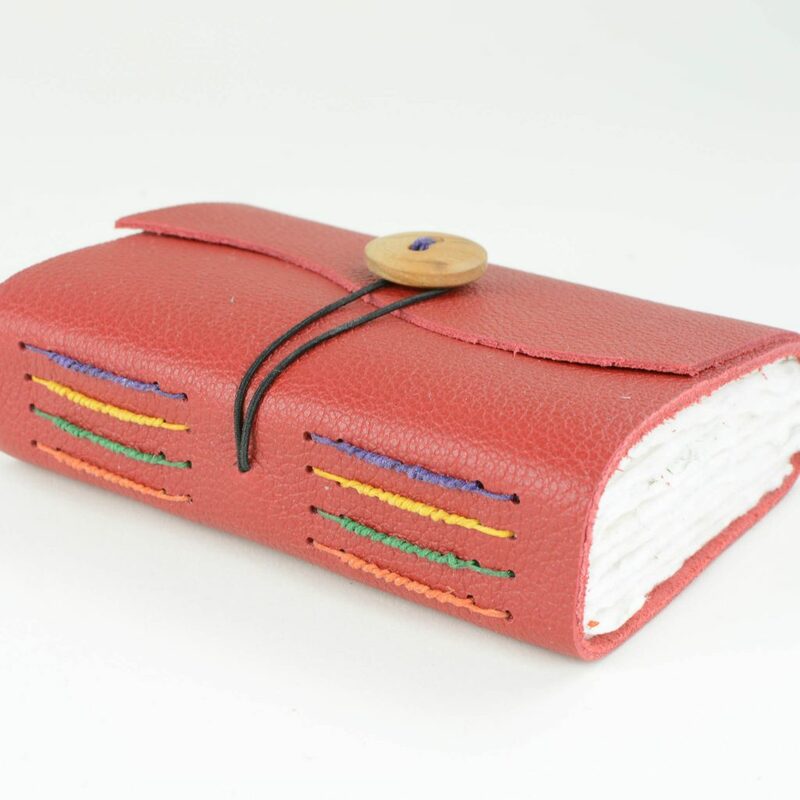 You can create a leather book using the tutorial I wrote for Keith Smith’s Alpha stitch binding. 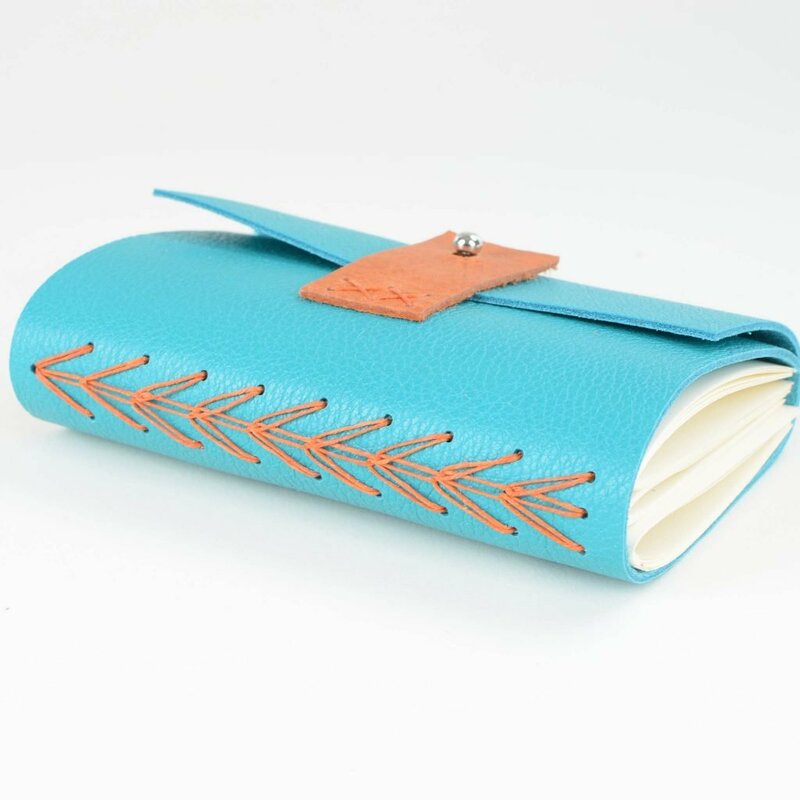 And below is a long stitch binding where each signature is sewn in individually so you can use different thread colors. Here are the instructions: Long Stitch with Packing Tutorial. Stay tuned because next week I’ll post a video on how I make one of these books. Wish I lived closer so I could take a class with you! I agree, glacken2016! I would love to take a real, face to face class! This is a wonderful post, Ali. Thank you for taking the time and sharing your resources. I’m with both of you…… I’m in Scotland. I have scavenged leather from couches left out at the curb for trash. Before you say “Ewwwww!”, the backs and sometimes the sides are usually pristine. So far my efforts have yielded leather thats backed with cloth. I dont think it’s vinyl because it doesn’t melt when exposed to heat. Can you recommend a way to reuse this? Thanks.